In today's world of automation, compressed air is used in many industries including high-precision machinery and instrumentation. After air is compressed it is cooled by an after-cooler or in a receiver tank, where condensate is formed from water droplets in the air. This condensate also occurs in compressed air distribution piping, leading to rust and fluctuation in high-precision machinery, as well as causing a reduction in product quality. 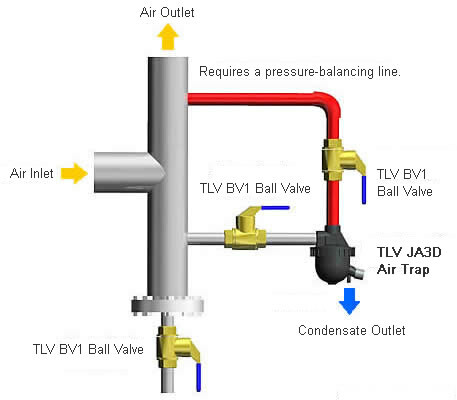 TLV air traps protect your equipment and products by discharging condensate automatically. The hinge-less free float has only one moving part, allowing for simple operation. With infinite sealing surfaces, the free float does not suffer from concentrated wear, maintaining initial performance quality over a long time period. 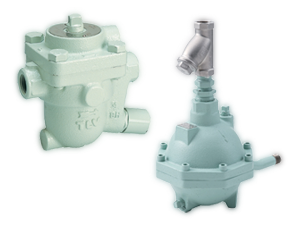 The float adjusts quickly to changes in condensate flow adjusting the valve seat opening, ensuring continuous rapid discharge without condensate backup. The standardized rubber valve seat allows for tight sealing with the precision ground float. Equipped with an external plunger unit, blockage caused by oils and/or scale can be easily eliminated. The valve seat cleaning mechanism enables removal of scale and other debris from the orifice. Debris is forcibly removed when the needle pierces through the blocked orifice, simultaneously pushing the float off its seat. This mechanism may help save time by removing light debris that causes blockage without having to completely disassemble and reassemble the air trap for maintenance. 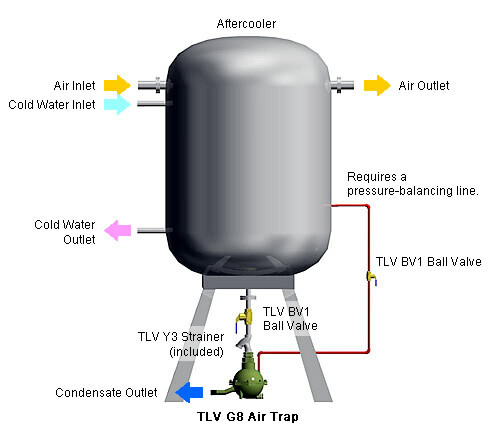 Air traps automatically discharge condensate that has entered the trap body. However, air can remain trapped within the body and completely block discharge (a problem known as "air binding"). A balancing line can be installed to remediate this problem. As condensate enters the trap, the float rises off the valve seat. The amount of condensate controls the size of the opening. 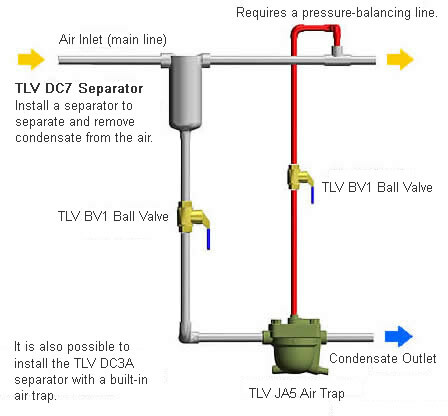 With the valve open, condensate is continuously discharged. At times when the condensate load increases significantly, the float is completely lifted off the valve seat, fully opening the valve and thus increasing the condensate discharge capacity. 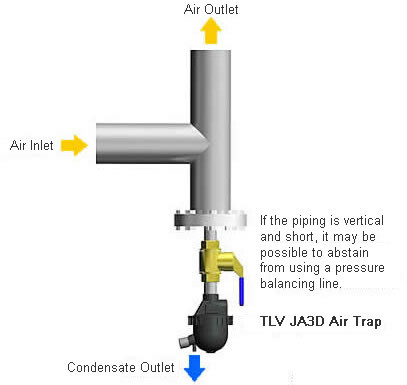 If no condensate enters the trap, the float lowers onto the valve seat, closing the valve opening. * Refer to the model's Specification Data Sheet for exact details about condensate loads.